The practical workbook for the Advanced Android Development course is now available as a series of Codelabs. Visit the course overview for more information. The Android operating system provides a strong foundation for building apps that run well on a wide range of devices and form factors. However, issues like complex lifecycles and the lack of a recommended app architecture make it challenging to write robust apps. Architecture Components provide libraries for common tasks such as lifecycle management and data persistence to make it easier to implement the recommended architecture. Architecture Components help you structure your app in a way that is robust, testable, and maintainable with less boilerplate code. What are the recommended Architecture Components? When it comes to architecture, it helps to see the big picture first. To introduce the terminology, here&apos;s a short overview of the Architecture Components and how they work together. Each component is explained more as you use it in this practical. The diagram below shows a basic form of the recommended architecture for apps that use Architecture Components. 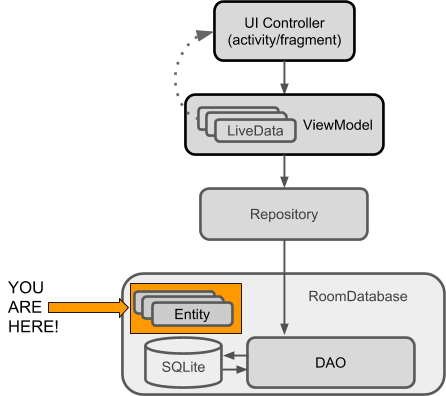 The architecture consists of a UI controller, a ViewModel that serves LiveData, a Repository, and a Room database. The Room database is backed by a SQLite database and accessible through a data access object (DAO). Each component is described briefly below, in detail in the Architecture Components concept chapter, and you will implement them in this practical. Because all the components interact, you will encounter references to these components throughout this practical, so here is a short explanation of each. Entity: In the context of Architecture Components, the entity is an annotated class that describes a database table. SQLite database: On the device, data is stored in a SQLite database. The Room persistence library creates and maintains this database for you. DAO: Short for data access object . A mapping of SQL queries to functions. You used to have to define these queries in a helper class. When you use a DAO, your code calls the functions, and the components take care of the rest. Room database: Database layer on top of a SQLite database that takes care of mundane tasks that you used to handle with a helper class. The Room database uses the DAO to issue queries to the SQLite database based on functions called. Repository: A class that you create for managing multiple data sources. In addition to a Room database, the Repository could manage remote data sources such as a web server. ViewModel : Provides data to the UI and acts as a communication center between the Repository and the UI. Hides the backend from the UI. ViewModel instances survive device configuration changes. LiveData : A data holder class that follows the observer pattern, which means that it can be observed. Always holds/caches latest version of data. Notifies its observers when the data has changed. Generally, UI components observe relevant data. LiveData is lifecycle aware, so it automatically manages stopping and resuming observation based on the state of its observing activity or fragment. It helps to be familiar with software architectural patterns that separate data from the UI. It helps to be familiar with the observer pattern. In summary, the observer pattern defines a one-to-many dependency between objects, so that whenever an object changes its state, all its dependents are notified and updated automatically. The main object is called the "subject" and its dependents are called the "observers." Usually, the subject notifies the observers by calling one of their methods. The subjects knows what methods to call, because the observers are "registered" with the subject and specify the methods to call. Important: This practical implements the architecture defined in the Guide to App Architecture and explained in the Architecture Components concepts chapter. It is highly recommended that you read the concepts chapter. 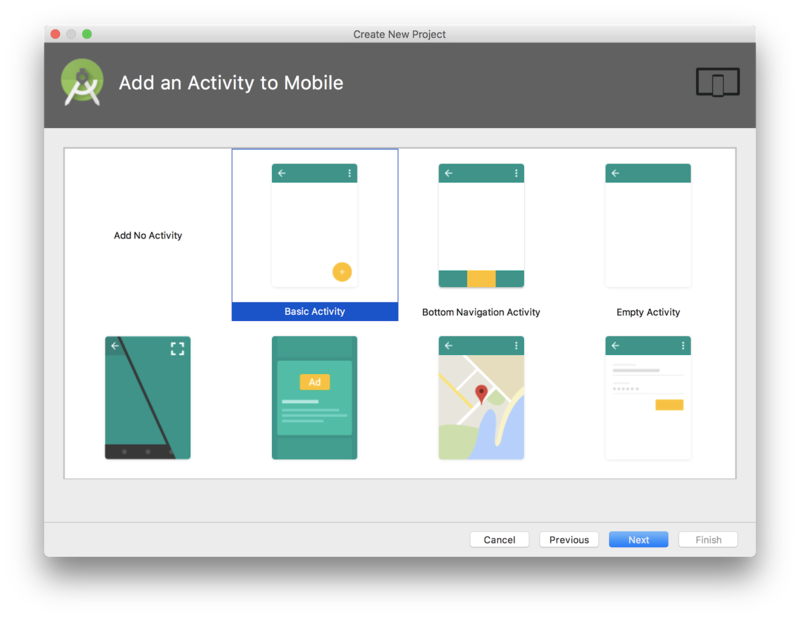 Design and construct an app using some of the Android Architecture Components. 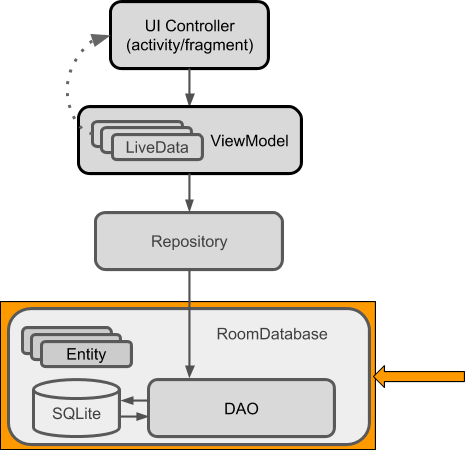 You&apos;ll use Room, ViewModel, and LiveData. Create an app with an Activity that displays words in a RecyclerView. Create an Entity that represents word objects. Define the mapping of SQL queries to Java methods in a DAO (data access object). Use LiveData to make changes to the data visible to the UI via observers. Add a Room database to the app for persisting data locally, and initialize the database. Abstract the data backend as a Repository class with an API that is agnostic to how the data is stored or acquired. Use a ViewModel to separate all data operations from the UI. Add a second Activity that allows the user to add new words. In this practical you build an app that uses the Android Architecture Components collection of libraries. The app, called RoomWordsSample, stores a list of words in a Room database and displays the list in a RecyclerView. 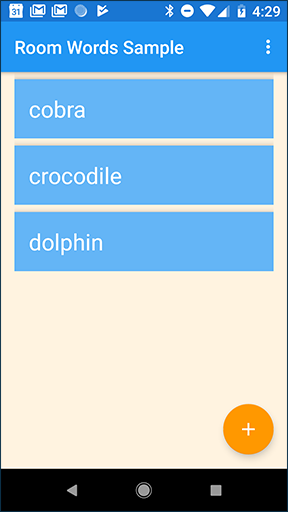 The RoomWordsSample app is basic, but sufficiently complete that you can use it as a template to build on. Note: Does this app sound familiar? In the Android Developer Fundamentals course you built several versions of the WorldList app using a SQLiteDatabase, an SQLiteOpenHelper, and then added a Contract and a ContentProvider. It was quite involved. Doing the same thing using Architecture Components is less complex, less code, and much better architecture. Works with a database to get and save words, and pre-populates the database with some words. Displays all the words in a RecyclerView in MainActivity. Opens a second Activity when the user taps the + FAB button. When the user enters a word, the app adds the word to the database and then the list updates automatically. 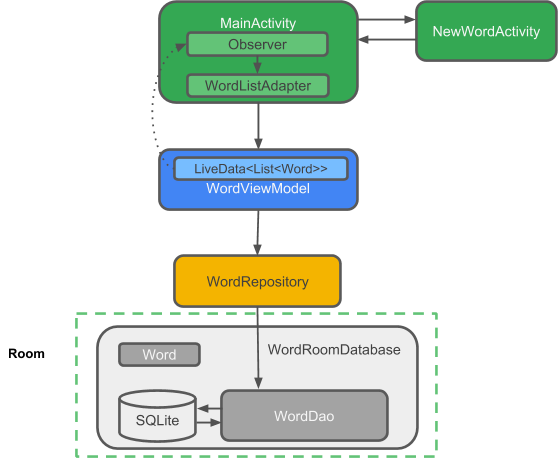 The following diagram mirrors the overview diagram from the introduction and shows all the pieces of the RoomWordsSample app. Each of the enclosing boxes (except for the SQLite database) represents a class that you create. Tip: Print or open this diagram in a separate tab so you can refer to it as you build the code. Note: In this advanced practical, you are expected to create member variables, import classes, and extract values as needed. Code that you are expected to be familiar with is provided but not explained. If you see check boxes for Include Kotlin support and Include C++ support, uncheck both boxes. Select only the Phone & Tablet form factor, and set the minimum SDK to API 14 or higher. In Android Studio, manually add the Architecture Component libraries to your Gradle files. Add the following code to your build.gradle (Module: app) file, to the bottom of the the dependencies block (but still inside it). In your build.gradle (Project: RoomWordsSample) file, add the version numbers at the end of the file. Important: Get the latest version numbers from the Adding Components to your Project page. Find the entry for the room and lifecycle libraries and the version number is at the end of the name after the colon. In the following example, the version numbers is 1.0.0: "android.arch.persistence.room:runtime:1.0.0"
The diagram below is the complete architecture diagram with the component that you are going to implement in this task highlighted. Every task will have such a diagram to help you understand where the current component fits into the overall structure of the app, and to see how the components are connected. The data for this app is words, and each word is represented by an entity in the database. In this task you create the Word class and annotate it so Room can create a database table from it. The diagram below shows a word_table database table. The table has one word column, which also acts as the primary key, and two rows, one each for "Hello" and "World." Create a class called Word. Add a constructor that takes a word string as an argument. Add the @NonNull annotation so that the parameter can never be null. Add a "getter" method called getWord()that returns the word. Room requires "getter" methods on the entity classes so that it can instantiate your objects. To make the Word class meaningful to a Room database, you must annotate it. Annotations identify how each part of the Word class relates to an entry in the database. Room uses this information to generate code. @Entity(tableName ="word_table") Each @Entity class represents an entity in a table. Annotate your class declaration to indicate that the class is an entity. Specify the name of the table if you want it to be different from the name of the class. @PrimaryKey Every entity needs a primary key. 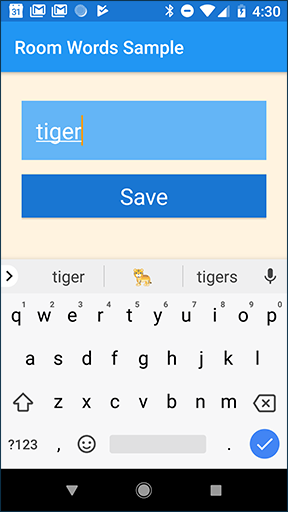 To keep things simple, each word in the RoomWordsSample app acts as its own primary key. To learn how to auto-generate unique keys, see the tip below. @NonNull Denotes that a parameter, field, or method return value can never be null. The primary key should always use this annotation. Use this annotation for any mandatory fields in your rows. @ColumnInfo(name ="word") Specify the name of a column in the table, if you want the column name to be different from the name of the member variable. Every field that&apos;s stored in the database must either be public or have a "getter" method. This app provides a getWord() "getter" method rather than exposing member variables directly. For a complete list of annotations, see the Room package summary reference. Update your Word class with annotations, as shown in the code below. Add the @Entity notation to the class declaration and set the tableName to "word_table". Annotate the mWord member variable as the @PrimaryKey. Require mWord to be @NonNull, and name the column "word". Note: If you type in the annotations, Android Studio auto-imports everything you need. Tip on auto-generating keys: To auto-generate a unique key for each entity, you would add and annotate a primary integer key with autoGenerate=true. See Defining data using Room entities. The data access object, or Dao, is an annotated class where you specify SQL queries and associate them with method calls. The compiler checks the SQL for errors, then generates queries from the annotations. For common queries, the libraries provide convenience annotations such as @Insert. The DAO must be an interface or abstract class. Room uses the DAO to create a clean API for your code. By default, all queries (@Query) must be executed on a thread other than the main thread. (You work on that later.) For operations such as inserting or deleting, if you use the provided convenience annotations, Room takes care of thread management for you. The DAO for this practical is basic and only provides queries for getting all the words, inserting words, and deleting all the words. Create a new interface and call it WordDao. Annotate the class declaration with @Dao to identify the class as a DAO class for Room. Tip: For this app, ordering the words is not strictly necessary. However, by default, return order is not guaranteed, and ordering makes testing straightforward. To learn more about DAOs, see Accessing data using Room DAOs. When you display data or use data in other ways, you usually want to take some action when the data changes. This means you have to observe the data so that when it changes, you can react. LiveData, which is a lifecycle library class for data observation, can help your app respond to data changes. If you use a return value of type LiveData in your method description, Room generates all necessary code to update the LiveData when the database is updated. In the WordDao interface, change the getAllWords() method signature so that the returned List<Word> is wrapped with LiveData<>. 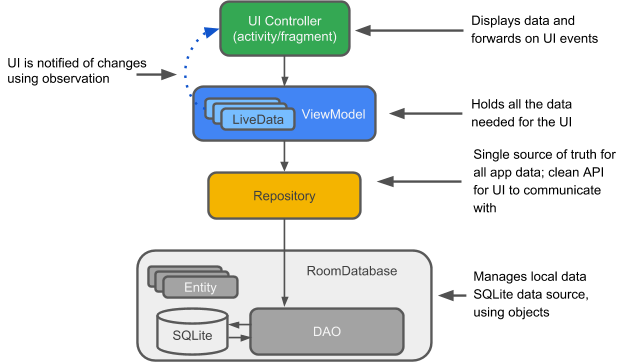 See the LiveData documentation to learn more about other ways to use LiveData, or watch this Architecture Components: LiveData and Lifecycle video. Room is a database layer on top of a SQLite database. Room takes care of mundane tasks that you used to handle with a database helper class such as SQLiteOpenHelper. 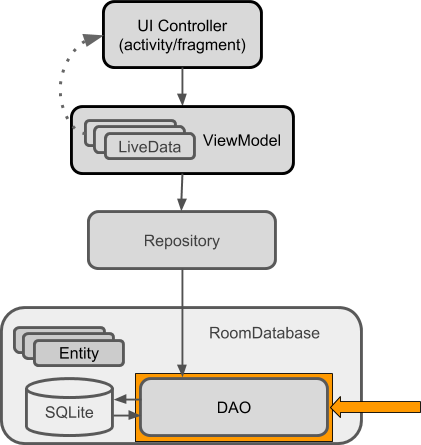 Room uses the DAO to issue queries to its database. By default, to avoid poor UI performance, Room doesn&apos;t allow you to issue database queries on the main thread. LiveData applies this rule by automatically running the query asynchronously on a background thread, when needed. Room provides compile-time checks of SQLite statements. Your Room class must be abstract and extend RoomDatabase. Usually, you only need one instance of the Room database for the whole app. Create a public abstract class that extends RoomDatabase and call it WordRoomDatabase. Annotate the class to be a Room database. Declare the entities that belong in the database—in this case there is only one entity, Word. (Listing the entities class or classes creates corresponding tables in the database.) Set the version number. Define the DAOs that work with the database. Provide an abstract "getter" method for each @Dao. Add code to create a database where indicated by the Create database here comment in the code above. The following code uses Room&apos;s database builder to create a RoomDatabase object named "word_database" in the application context from the WordRoomDatabase class. Add a migration strategy for the database. In this practical you don&apos;t update the entities and the version numbers. However, if you modify the database schema, you need to update the version number and define how to handle migrations. For a sample app such as the one you&apos;re creating, destroying and re-creating the database is a fine migration strategy. For a real app, you must implement a non-destructive migration strategy. See Understanding migrations with Room. // if no Migration object. // Migration is not part of this practical. Important: In Android Studio, if you get errors when you paste code or during the build process, make sure you are using the full package name for imports. See Adding Components to your Project. Then select Build > Clean Project. Then select Build > Rebuild Project, and build again. A Repository is a class that abstracts access to multiple data sources. The Repository is not part of the Architecture Components libraries, but is a suggested best practice for code separation and architecture. A Repository class handles data operations. It provides a clean API to the rest of the app for app data. A Repository manages query threads and allows you to use multiple backends. In the most common example, the Repository implements the logic for deciding whether to fetch data from a network or use results cached in the local database. Create a public class called WordRepository. Add member variables for the DAO and the list of words. Add a constructor that gets a handle to the database and initializes the member variables. Add a wrapper method called getAllWords() that returns the cached words as LiveData. Room executes all queries on a separate thread. Observed LiveData notifies the observer when the data changes. Add a wrapper for the insert() method. Use an AsyncTask to call insert() on a non-UI thread, or your app will crash. Room ensures that you don&apos;t do any long-running operations on the main thread, which would block the UI. Note: For this simple example, the Repository doesn&apos;t do much. For a more complex implementation, see the BasicSample code on GitHub. The ViewModel is a class whose role is to provide data to the UI and survive configuration changes. 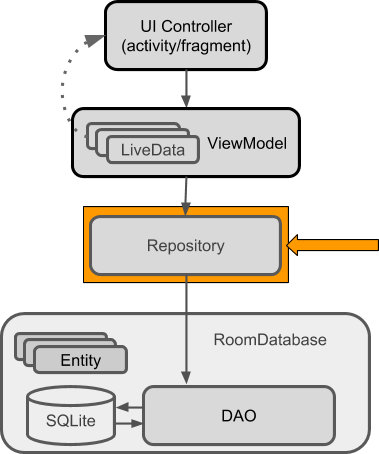 A ViewModel acts as a communication center between the Repository and the UI. 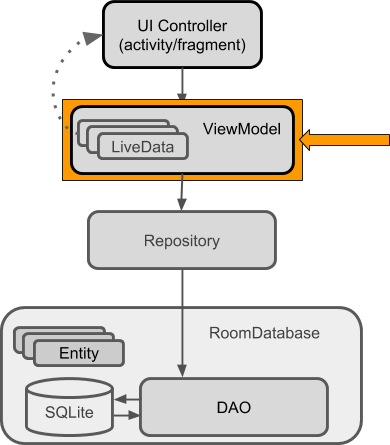 The ViewModel is part of the lifecycle library. For an introductory guide to this topic, see ViewModel. A ViewModel holds your app&apos;s UI data in a way that survives configuration changes. Separating your app&apos;s UI data from your Activity and Fragment classes lets you better follow the single responsibility principle: Your activities and fragments are responsible for drawing data to the screen, while your ViewModel is responsible for holding and processing all the data needed for the UI. In the ViewModel, use LiveData for changeable data that the UI will use or display. Create a class called WordViewModel that extends AndroidViewModel. Warning: Never pass context into ViewModel instances. 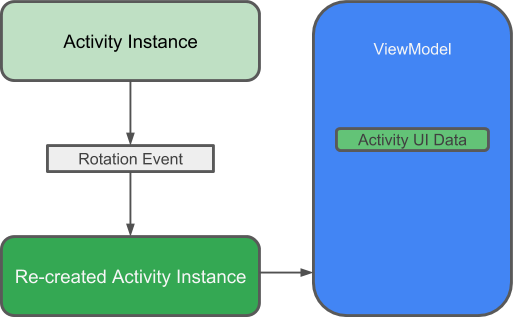 Do not store Activity, Fragment, or View instances or their Context in the ViewModel. Add a private member variable to hold a reference to the Repository. Add a private LiveData member variable to cache the list of words. Add a constructor that gets a reference to the WordRepository and gets the list of all words from the WordRepository. Add a "getter" method that gets all the words. This completely hides the implementation from the UI. Create a wrapper insert() method that calls the Repository&apos;s insert() method. In this way, the implementation of insert() is completely hidden from the UI. To learn more, watch the Architecture Components: ViewModel video. Next, add the XML layout for the list and items to be displayed in the RecyclerView. This practical assumes that you are familiar with creating layouts in XML, so the code is just provided. Select File > New > Vector Asset. Click the Android robot icon in the Icon: field, then select the + ("add") asset. In the layout/activity_main.xml file, in the FloatingActionButton, change the srcCompat attribute to:. You are going to display the data in a RecyclerView, which is a little nicer than just throwing the data in a TextView. This practical assumes that you know how RecyclerView, RecyclerView.LayoutManager, RecyclerView.ViewHolder, and RecyclerView.Adapter work. Add a class WordListAdapter class that extends RecyclerView.Adapter. The adapter caches data and populates the RecyclerView with it. The inner class WordViewHolder holds and manages a view for one list item. // Covers the case of data not being ready yet. // mWords has not been updated (means initially, it&apos;s null, and we can&apos;t return null). Note: The mWords variable in the adapter caches the data. In the next task, you add the code that updates the data automatically. Note: The getItemCount() method needs to account gracefully for the possibility that the data is not yet ready and mWords is still null. In a more sophisticated app, you could display placeholder data or something else that would be meaningful to the user. Run your app to make sure the app compiles and runs. There are no items, because you have not hooked up the data yet. The app should display the empty recycler view. There is no data in the database yet. You will add data in two ways: Add some data when the database is opened, and add an Activity for adding words. Every time the database is opened, all content is deleted and repopulated. This is a reasonable solution for a sample app, where you usually want to restart on a clean slate. To delete all content and repopulate the database whenever the app is started, you create a RoomDatabase.Callback and override the onOpen() method. Because you cannot do Room database operations on the UI thread, onOpen() creates and executes an AsyncTask to add content to the database. If you need a refresher on AsyncTask, see AsyncTaks and AsyncTaskLoader in the Android Fundamentals course. 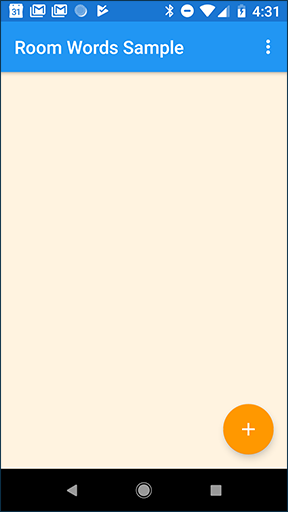 Create an inner class PopulateDbAsync that extends AsycTask. Implement the doInBackground() method to delete all words, then create new ones. Here is the code for the AsyncTask that deletes the contents of the database, then populates it with an initial list of words. Feel free to use your own words! * Populate the database in the background. // Start the app with a clean database every time. Now that you have created the method to populate the database with the initial set of words, the next step is to add the code to display those words in the RecyclerView. 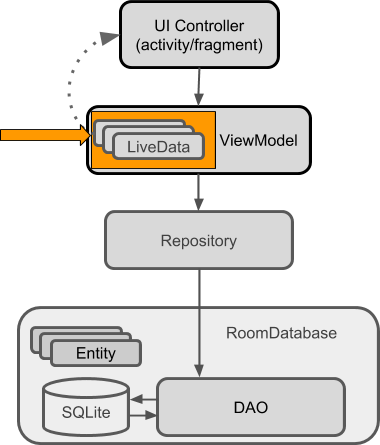 To display the current contents of the database, you add an observer that observes the LiveData in the ViewModel. Whenever the data changes (including when it is initialized), the onChanged() callback is invoked. In this case, the onChanged() callback calls the adapter&apos;s setWord() method to update the adapter&apos;s cached data and refresh the displayed list. In MainActivity, create a member variable for the ViewModel, because all the activity&apos;s interactions are with the WordViewModel only. In the onCreate() method, get a ViewModel from the ViewModelProviders class. Use ViewModelProviders to associate your ViewModel with your UI controller. When your app first starts, the ViewModelProviders creates the ViewModel. When the activity is destroyed, for example through a configuration change, the ViewModel persists. When the activity is re-created, the ViewModelProviders return the existing ViewModel. See ViewModel. Also in onCreate(), add an observer for the LiveData returned by getAllWords(). When the observed data changes while the activity is in the foreground, the onChanged() method is invoked and updates the data cached in the adapter. Note that in this case, when the app opens, the initial data is added, so onChanged() method is called. // Update the cached copy of the words in the adapter. Run the app. 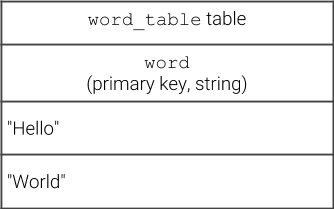 The initial set of words appears in the RecyclerView. Use the Empty Activity template to create a new activity, NewWordActivity. Verify that the activity has been added to the Android Manifest. Implement the NewWordActivity class. The goal is that when the user presses the Save button, the new word is put in an Intent to be sent back to the parent Activity. In MainActivity, add the onActivityResult() callback for the NewWordActivity. If the activity returns with RESULT_OK, insert the returned word into the database by calling the insert() method of the WordViewModel. RUN YOUR APP! When you add a word to the database in NewWordActivity, the UI automatically updates. Add a word that already exists in the list. What happens? Does your app crash? Your app uses the word itself as the primary key, and each primary key must be unique. You can specify a conflict strategy to tell your app what to do when the user tries to add an existing word. To learn about other conflict strategies, see the OnConflictStrategy reference. Run your app again and try adding a word that already exists. What happens now? You have an app that displays words in a list (MainActivity, RecyclerView, WordListAdapter). You can add words to the list (NewWordActivity). A word is an instance of the Word entity class. The words are cached in the RecyclerViewAdapter as a List of words (mWords). The list is automatically updated and redisplayed when the data changes. The automatic update happens because in the MainActivity, there is an Observer that observes the words and is notified when the words change. When there is a change, the observer&apos;s onChange() method is executed and updates mWords in the WordListAdapter. The data can be observed because it is LiveData. And what is observed is the LiveData<List<Word>> that is returned by the WordViewModel object. The WordViewModel hides everything about the backend from the user interface. It provides methods for accessing the UI data, and it returns LiveData so that MainActivity can set up the observer relationship. Views, activities, and fragments only interact with the data through the ViewModel. As such, it doesn&apos;t matter where the data comes from. In this case, the data comes from a Repository. The ViewModel does not need to know what that Repository interacts with. It just needs to know how to interact with the Repository, which is through the methods exposed by the Repository. The Repository manages one or more data sources. In the RoomWordsSample app, that backend is a Room database. Room is a wrapper around and implements a SQLite database. Room does a lot of work for you that you used to have to do yourself. For example, Room does everything that you used to use a SQLiteOpenHelper class to do. The DAO maps method calls to database queries, so that when the Repository calls a method such as getAllWords(), Room can execute SELECT * from word_table ORDER BY word ASC. The result returned from the query is observed LiveData. Therefore, every time the data in Room changes, the Observer interface&apos;s onChanged() method is executed and the UI is updated. The related concept documentation is Architecture Components.